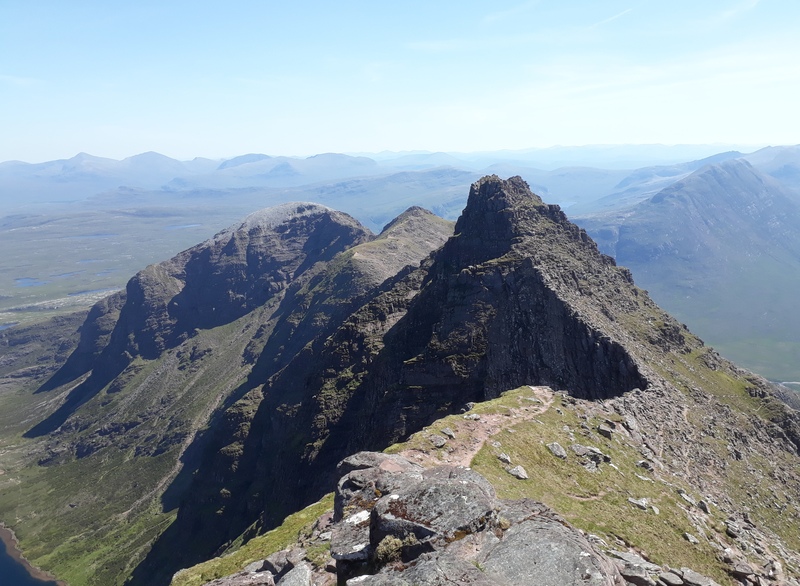 After a couple of days in Fisherfield, I had planned to strike camp early, and walk to somewhere in the lower reaches of Coir' a' Giubhsachain for a third night under canvas, and to start an ascent of An Teallach from there. However, looking at the map again the previous night, I'd realised that the ideal camp location from a logistics viewpoint was actually quite near where I'd parked the car; and on top of that, the location I'd envisaged looked like a prime haunt for both midges and clegs, both of which mortal enemies had deployed full strength battalions the previous day. 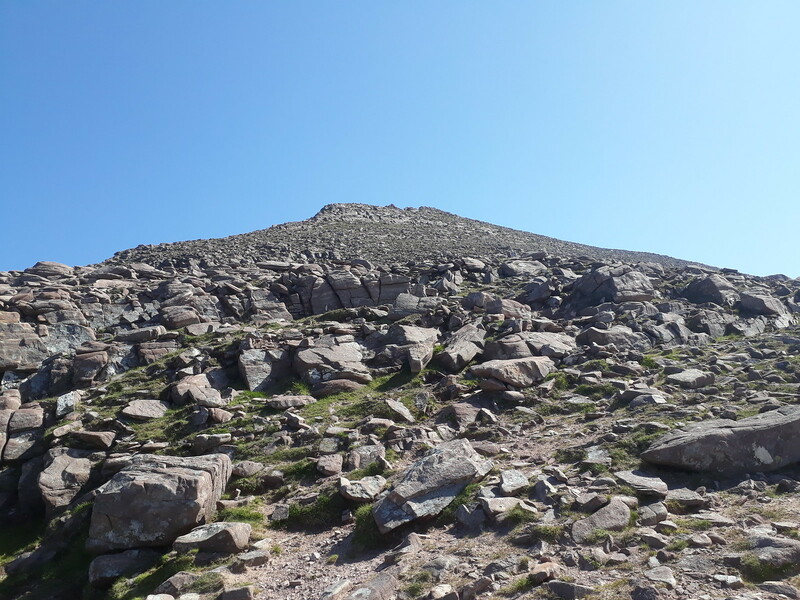 So I changed plan: walk back to the car from Shenevall first thing, dump the gear, then walk part-way back up the path to start an anticlockwise traverse at the Sail Liath end - which seemed to offer the best scrambling opportunities. 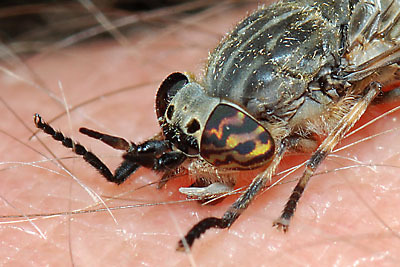 It's already extremely hot, and the clegs are full of early morning energy - I've sent a good few more to the eternal fires of clegdom by the time I get back to the car! Here I have a leisurely breakfast, sort my day pack, and get started at about 10.15. 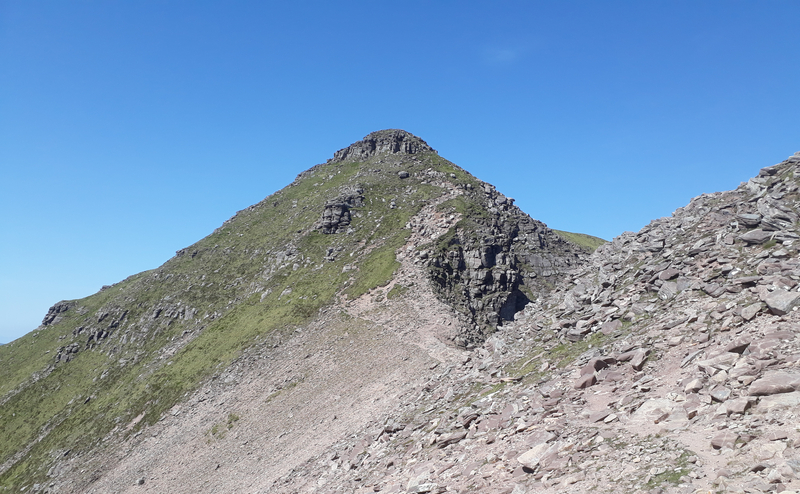 About half way to the point where the Sail Liath path diverges from the Shenevall path, I meet a fellow walker who's heading off into Fisherfield for a few days photography. He has a truly enormous pack, but he tells me it weighs only just over 10 kg!!!! I can hardly believe it, but he does tell me it's cost him a fortune to get it down to that weight - apparently he and his partner do a lot of multi-day stuff, and have put a lot of effort into cutting down weight (even to the point of carrying dry wet wipes ). We chat companionably until our ways part. 20180627_112626. 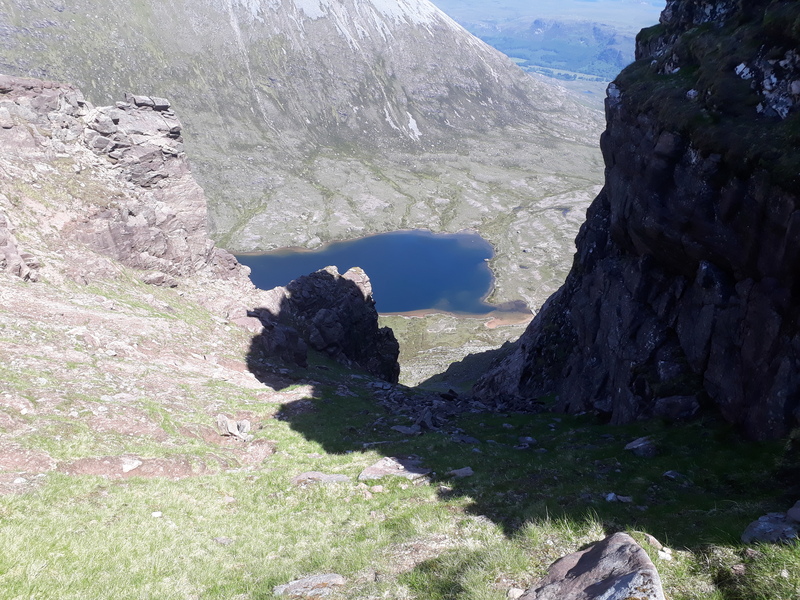 I very quickly lose the path, and just yomp in a more or less straight line heading directly for the south east shoulder of Sail Liath, making a few small diversions whenever I spy any flowing water in order to drink as much as I can before I get up on to the dry ridge. 20180627_115344. 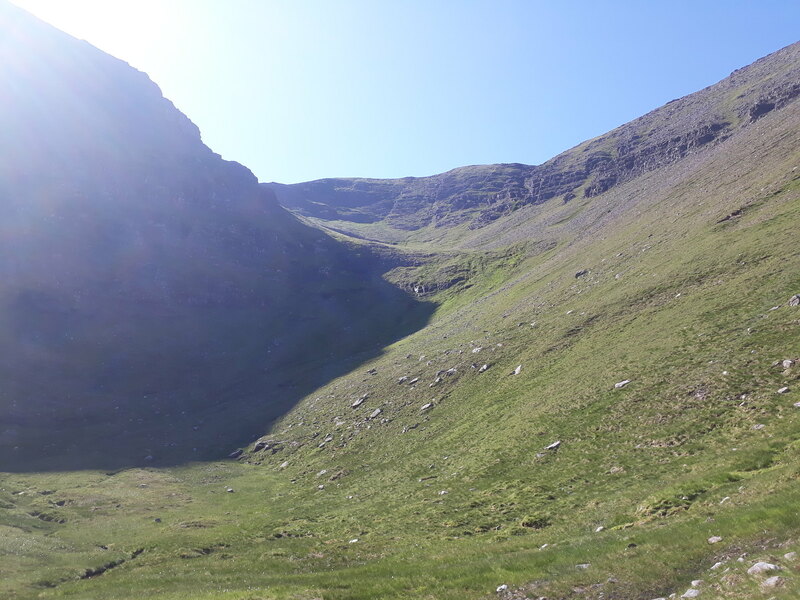 It's not far short of 600m ascent, and quite hard going in the midday heat - which must be in the mid 20s. So the fabulous views provide a good excuse for frequent rests. Looking back more or less south east, I think we have the Beinn Deargs to the left, and the Fannichs to the right (but I'd stand corrected on that). 20180627_123944. 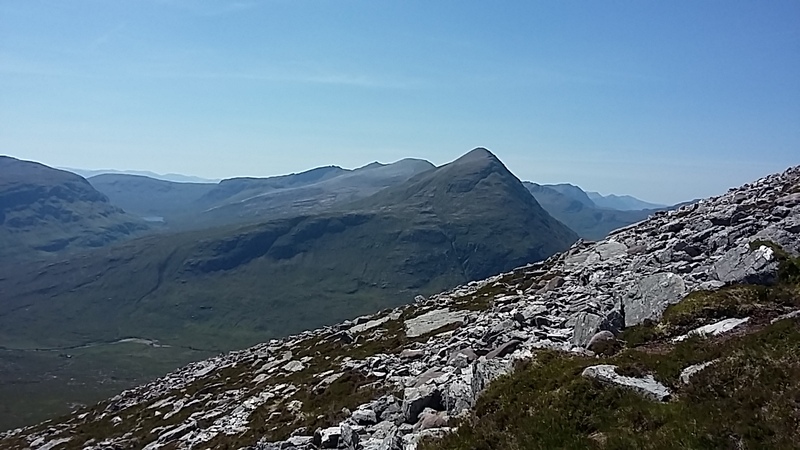 And from a few hundred metres further up, approaching the summit of Sail Liath, the full spread of magnificent Fisherfield, with most of the hills I'd traversed the previous day clearly visible... (Ruadh Stac Mor and Mullach Coire Mhic Fhearchair are, I think, hidden behind other hills). Wow!!! 20180627_124103. 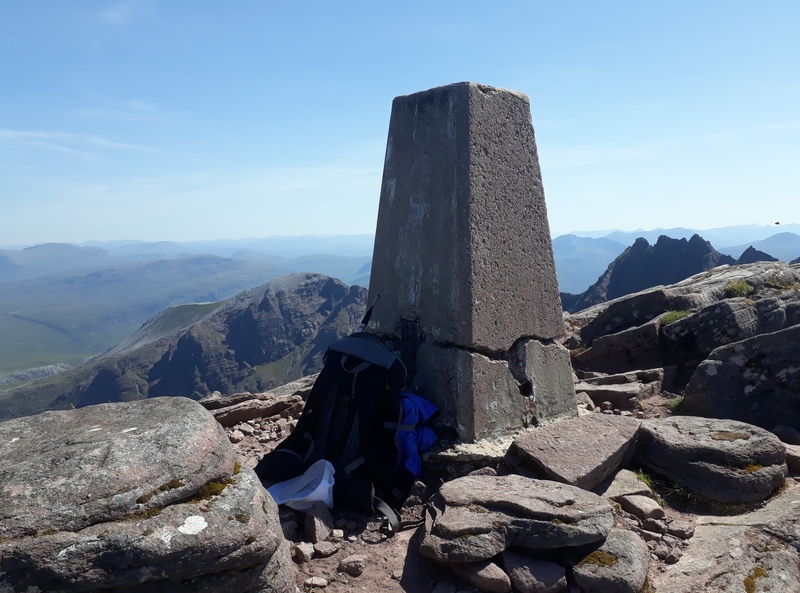 The whole of An Teallach only comes into view more or less at the summit itself. Again: Wow!!! 20180627_125032. There's a pretty clear path to Stob Cadha Gobhlach, with this rather dramatic view down to Loch Toll an Lochain on the way. 20180627_125039. It's a short pull up to the summit. 20180627_125209. 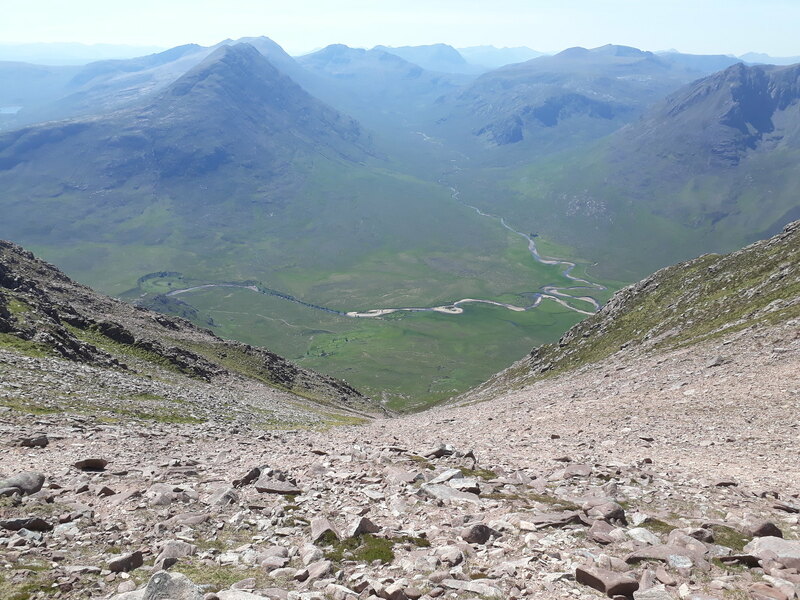 From the bealach between Sail Liath and SCG, looking down a veeeerrrry long chute into Fisherfield and Strath na Sealga, Shenevall bothy down in the bottom, just left of centre. 20180627_130058. 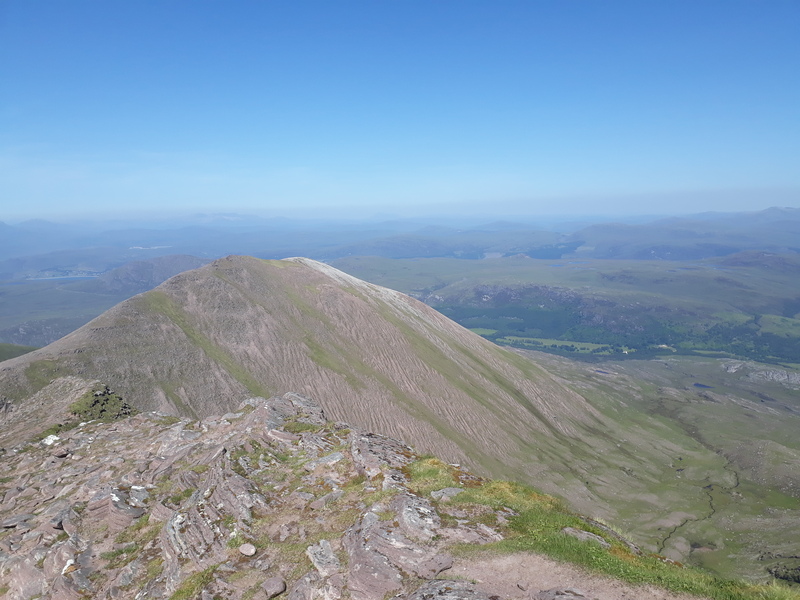 Looking back south east from the summit of Stob Cadha Gobhlach. At this point things go a bit skew-whiff! 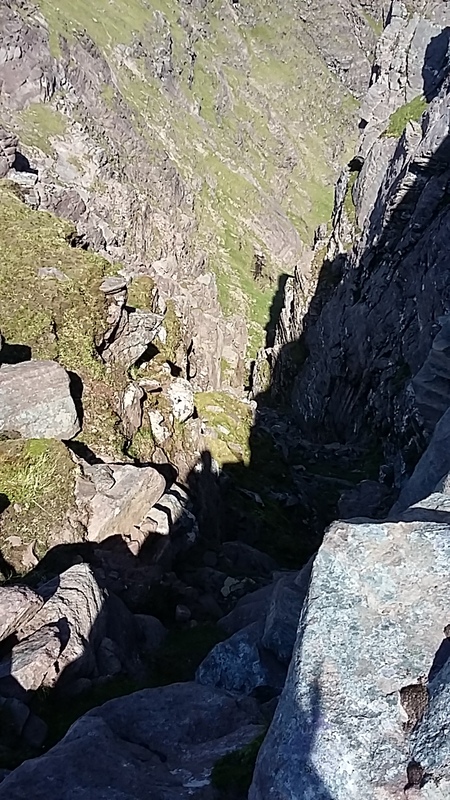 Whilst I've read various accounts of the Pinnacles traverse, I hadn't really internalised the route, and when I get to the bottom of the first pinnacle, I don't see any sign of any obvious route ahead (ie up) - no crampon marks, polish, or the like. So I assume that the ascent route must start a bit to the left, and start to follow the lower bypass path. 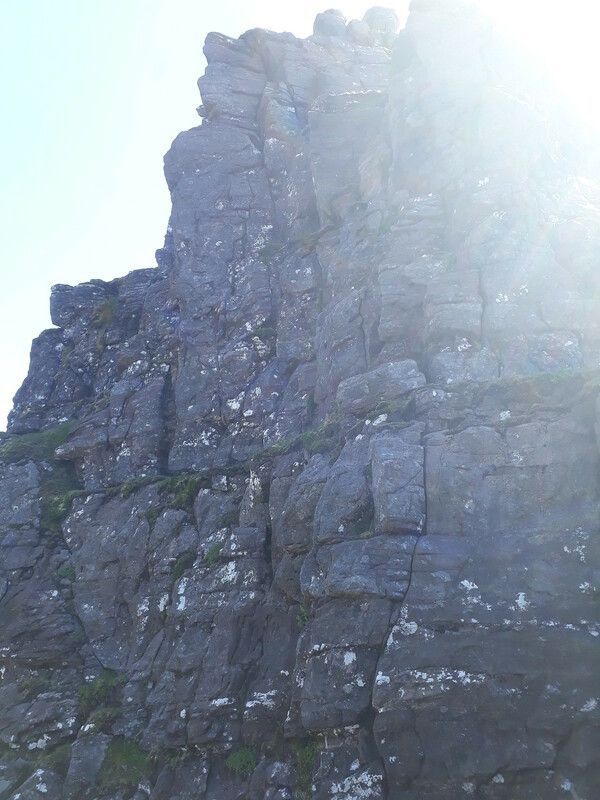 It doesn't take long before I began to get uneasy, however: looking up to my right, I seem to be passing a lot of prime scrambling rock by . Not good! However, it's now clear that I am on the wrong route. So I turn back and return the way I've come along the path until I judge that I am more or less directly below the first of the pinnacles. 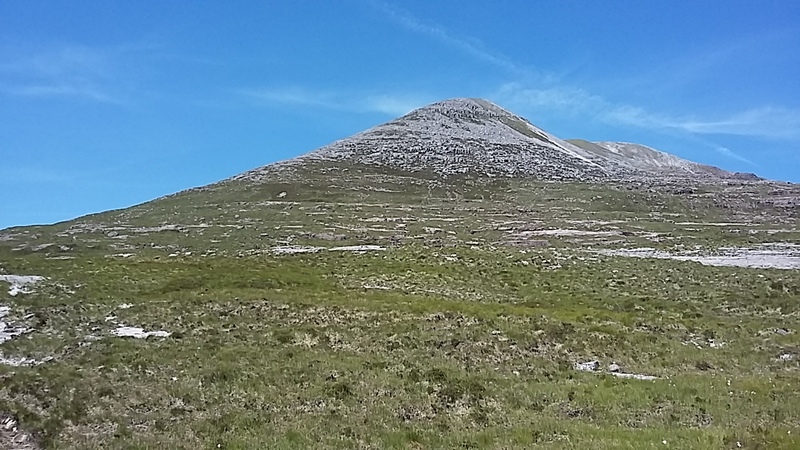 Then I just cut straight up the slope - which is quite steep, and culminates in 10 or 15m of not too difficult scrambling at the top to get on to the ridge. 20180627_141849. And looking back the way I've just come from Lord Berkeley's Seat. All very airy and exhilarating, especially as it's quite possible to walk along the absolute top of the ridge. 20180627_141845. The seat itself. I have to admit, I do toy with the idea of sitting on it, but as I can't see how well it is supported, I chicken out (in fact, when I descend the other side, it's clear that it isn't a cantilever, and so is undoubtedly very stable). 20180627_142046. 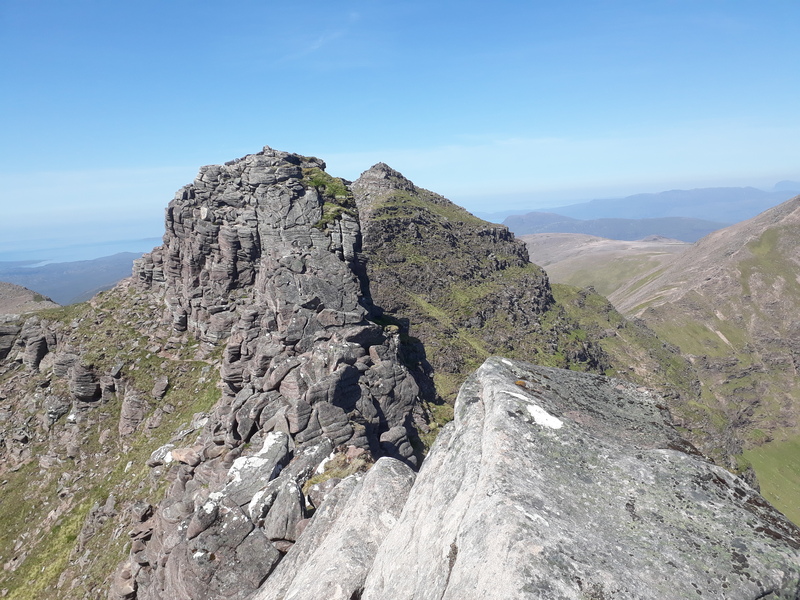 Looking north from Lord Berkeley's Seat towards Sgurr Fiona. 20180627_143725. 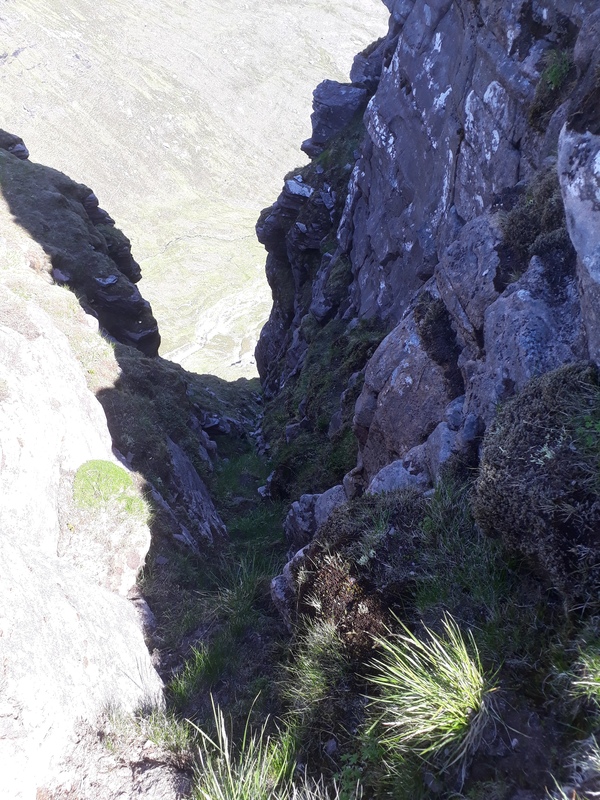 On the descent, looking up towards the Seat, I see that I've been a bit of a wuss. But wusses generally do live to scramble another day (which, desperately sadly, Ueli Steck didn't ). 20180627_145528. 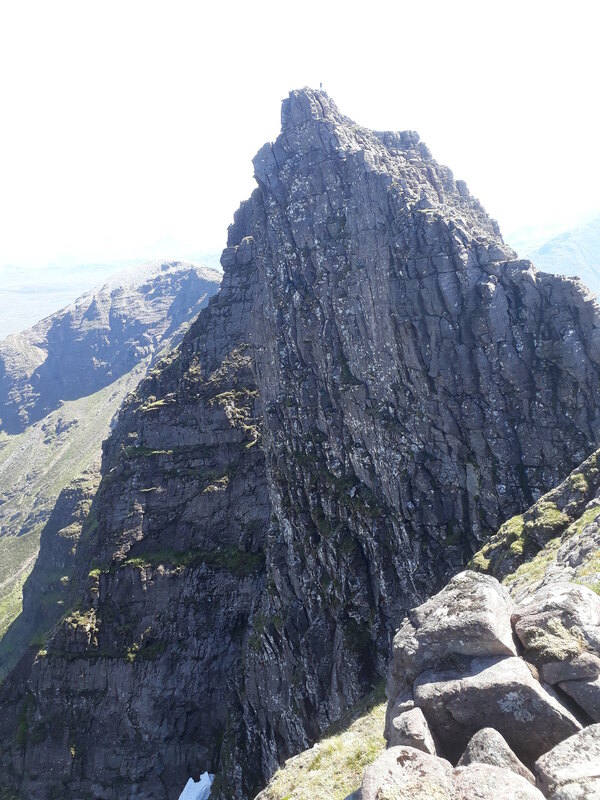 After the pinnacles, the ascent of Sgurr Fiona is something of an anti-climax. 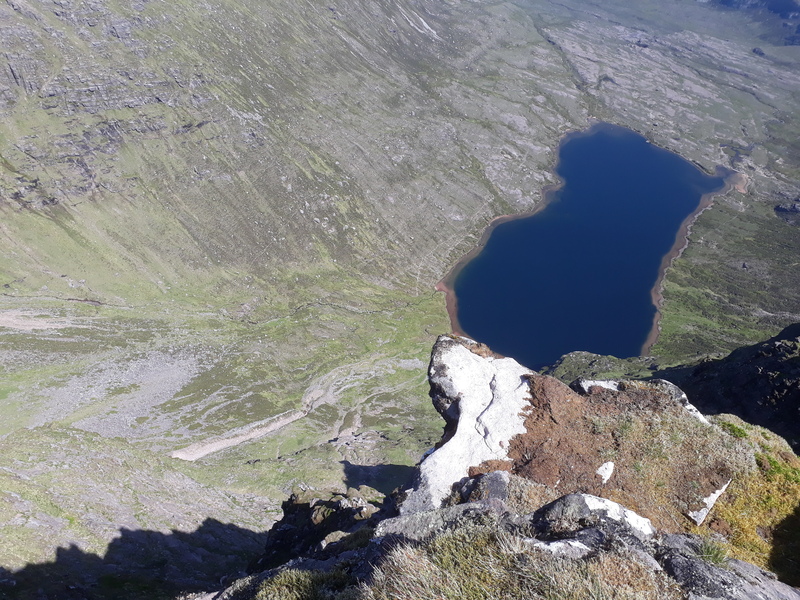 However, the views from the summit make up for that, this looking NNE towards Bidein a'Ghlas Thuill. 20180627_145629. During the course of this walk it's beginning to dawn on me why the estimated time seems considerably on the high side for the ascent and distance involved: one spends so much time gawping in every direction that one just forgets to walk! This is looking back the way I've come so far. 20180627_151640. Every way I look it so words-failingly dramatic, that it's hard not to keep snappin'... This is really a walk to spend 12, rather than 8 hours on. 20180627_154429. 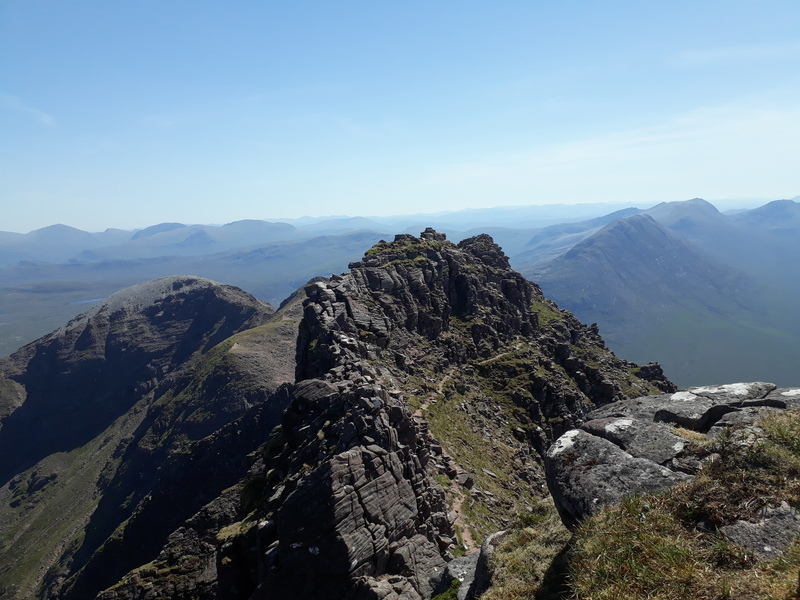 On reaching the summit of Bidein a'Ghlas Thuill I find a couple of guys dozing in the sun with their hats over their faces. It is such a wonderful image: relaxation in the most aesthetically perfect environment conceivable - I would like to take a pic of them; but it feels like it would be a tasteless intrusion, and I refrain. But the image really is branded on my memory. 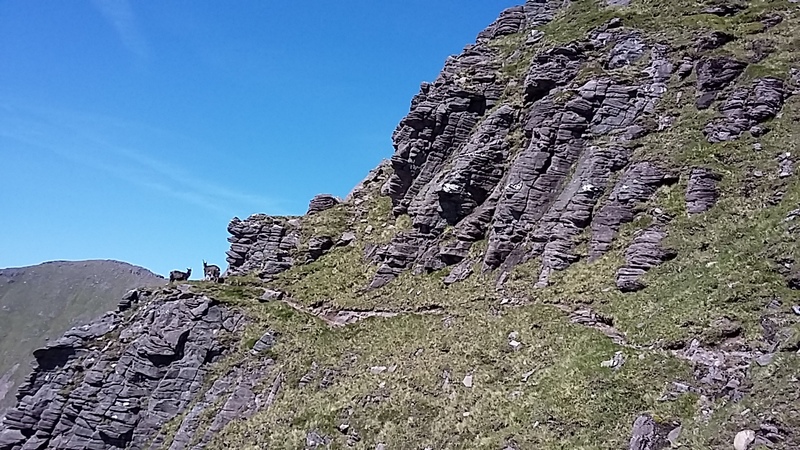 I take my lead from these wise fellows, and spend a good while just sitting and imbibing the panoramas, chewing on a cheeze-salami-and-Branston-Pickle sarny as I do so. Pleasure and satisfaction beyond price. 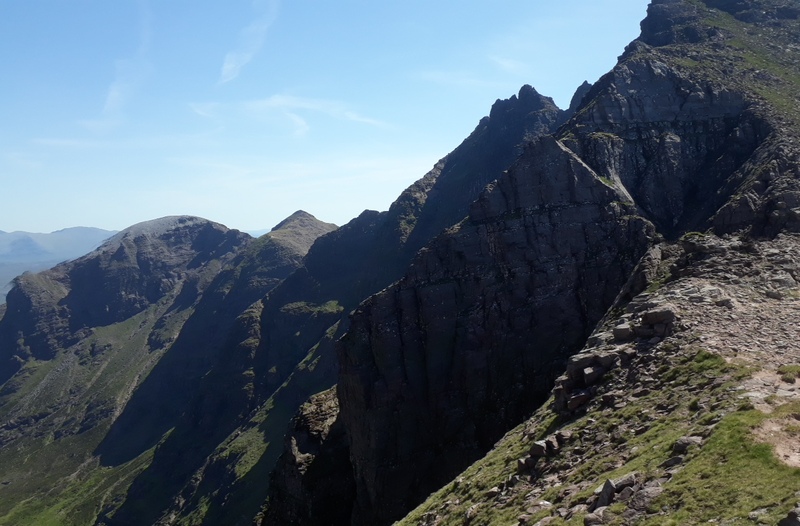 Eventually the two guys stir, and after a bit of a blether (I bumped into them on the way back to the car from Shenevall), we head off north towards the bealach. 20180627_154443. 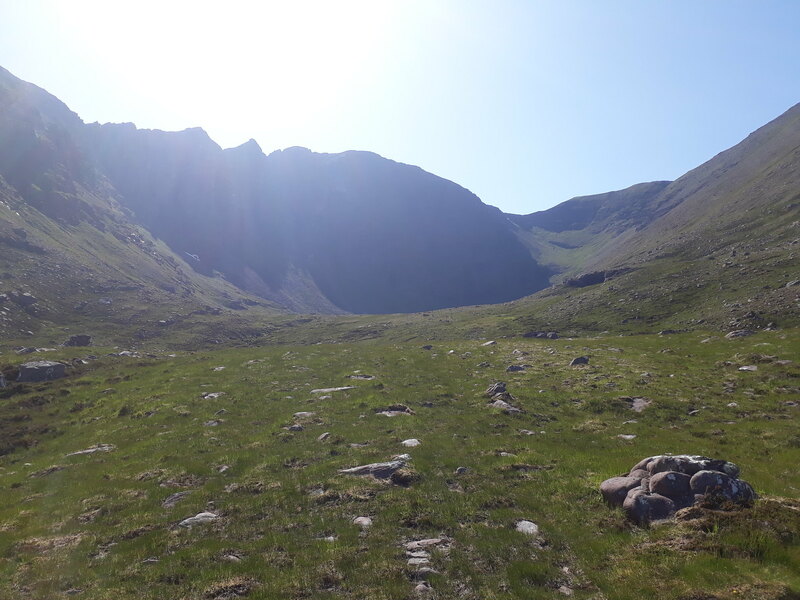 The current plan is to head out to Glas Mheall Mor, then drop off the south side on one of the green-looking areas and down into Glas Tholl (Glas Thuill surely...???). 20180627_160805. 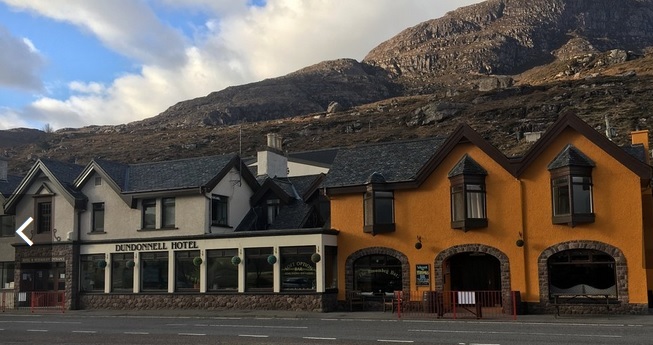 But then I see that there's a clear path - not shown on the map - that comes up from the west, crosses the bealach, descends into Glas Tholl, and goes all the way to Dundonnell House. 20180627_161351. 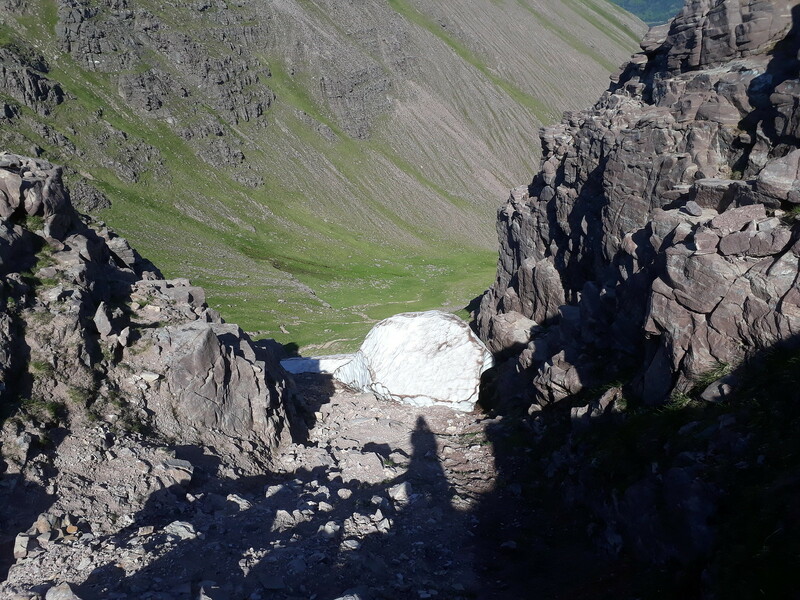 The initial part of the path is almost entirely blocked by an enormous remnant snow drift; but there's a narrow gap on the left where I suppose the reflected heat from the ground has melted the snow, and - with a bit of a squeeze - I get round it OK.
20180627_161419. 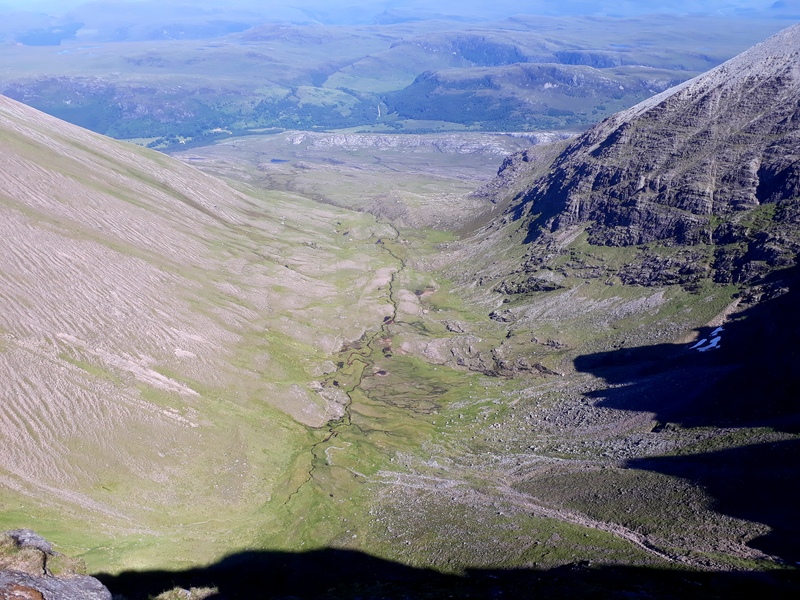 A final look back at Bidein a'Ghlas Thuill before the start of the descent. 20180627_164116. And the same, from rather further down and a bit later. I plod on. Just before the path hits the road, there's a slight diversion as the allt takes a 90 degree bend, but I can't be bothered and just wade through the water as I am - I'm sure my sweat-soaked socks and trainers need a good wash anyway. Fortunately, the Allt Gleann Charoachain passes beneath the road just north of the car park, so as soon as I arrive there, I locate my towel, and pop down for a dip. There's a nice deep dub right next to the road, and the water is bonkers warm, so I can luxuriate in fresh water splendour until I feel thoroughly cleansed of sweat. Sadly Wednesday is its closing day . So I hit the road. After a pint of which glorious liquid, I head off south on the 10 hour drive, stopping for a few hours sleep on the way, and pulling into my drive at around 08.00 on Thursday (hopefully, to gain some brownie points with the CEO for being back earlier than expected....). Sure is a great hill! 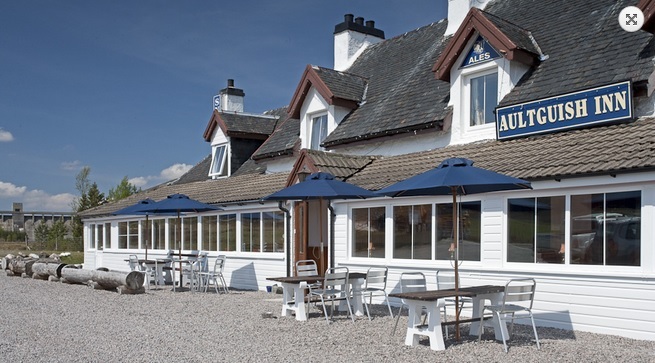 - maybe Scotland's best. The first time I did it - aged 20 or so, there were no such thing as guides - just maps - so we drove about 4km beyond Corrie Hallie and set off about due W across the moor: terrain was not a concept i understood at that time. Thanks spiderwebb. The pinnacles were unquestionably the highlight for me, so can definitely recommend them! Yep, with the pinnacles, AT deserves its reputation. Brilliant. 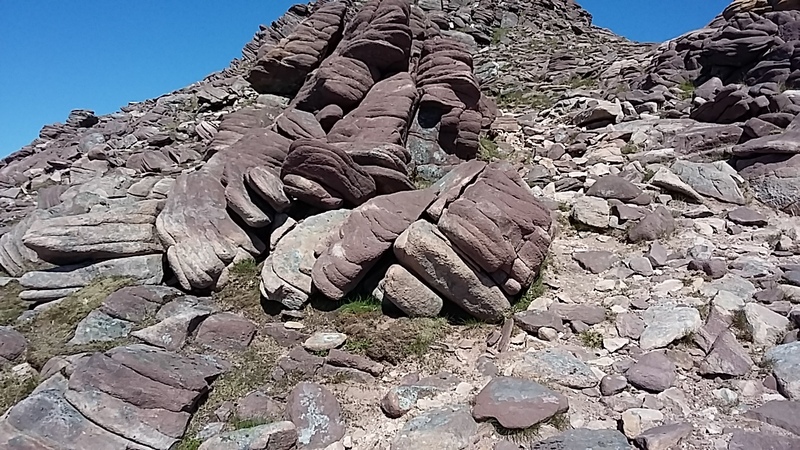 The classic An Teallach traverse. Stunning weather and stunning photos. Iconic is the word. Must do that one again some time!